Today’s Archtober Building of the Day tour took us to Brooklyn Grange, located on top of Brooklyn Navy Yard’s Building 3. Once we had assembled on the 11th floor, with its sweeping views of the Manhattan and Brooklyn skylines, Gwen Schantz, co-founder and CEO, took us around the intimate yet extraordinarily productive farm. Schantz, who heads the farm’s landscaping division, revealed not only the specific agricultural details of the farm but also how they have managed to turn urban agriculture into a viable business model. Brooklyn Grange’s roots date to 2009, when Ben Flanner, now president, quit his job in finance to open Eagle Street Rooftop Farm in Brooklyn. One year later, joined by Schantz and other partners, he opened the organization’s permanent foothold in Long Island City; they soon after added the location in the Brooklyn Navy Yard. The organization has since become a worldwide leader in urban agriculture efforts. Central to Brooklyn Grange’s mission is to do more than just grow food. Schantz went so far as to describe it primarily as an educational center, facilitated by City Growers, an educational nonprofit that Brooklyn Grange (which is for-profit) founded but has since spun off. Schantz emphasized that it would be extremely difficult to turn a profit solely by selling produce, but that Brooklyn Grange stays financially feasible by designing gardens and landscapes and hosting events. Rather than seeing these aspects as a necessary evil, Schantz described them as equal to the agriculture department. Brooklyn Grange’s goal, she said, was to show that urban agriculture can be a viable enterprise—a goal which has been amply met. As we walked around the farm, Schantz described the its physical makeup. The farm uses a soil mix of 50 percent is expanded shale, which is put in a kiln and broken up slightly to be porous, almost like coral. This allows small organisms to live in the soil, a central aspect of organic farming. The other 50 percent of the soil is a compost mix sourced from mushroom farms in Pennsylvania. Schantz said that Brooklyn Grange have found they can grow almost any crop in about a foot of soil—a surprisingly thin layer. That is not to say that they do grow any crop. Brooklyn Grange focuses on more profitable crops, primarily lettuce. However, since selling directly to the community is an important part of Brooklyn Grange’s mission, and since crop rotation is a key aspect of organic farming, they do plant other crops as well, such as tomatoes, peppers, and broccoli. During the off-season, employees organize events and work on the other elements of the farm. According to Schantz, the roof of Building 3 is perfect for a farm, as it was used to support extensive Navy training installations and is therefore extremely strong. To create the farm, a large hose connected to a mixer truck sprayed the roof with the first layer of soil. To augment that original soil, Brooklyn Grange regularly brings additional soil up in the freight elevator, another useful original feature. Along with the mushroom farm compost, other compost mixes come from Brooklyn Navy Yard tenants such as chocolate makers Mast. 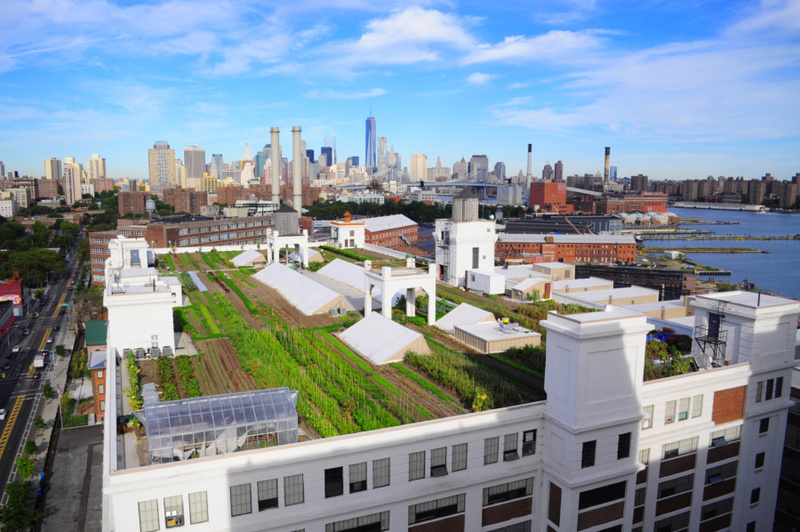 Brooklyn Grange does far more than grow food. It keeps bees at hives around the city, too. It serves an essential function by absorbing rainfall, relieving the burden on the city’s overtaxed stormwater management system. It educates schoolchildren from around the city about food and farming. It designs other landscapes. It hosts events ranging from dinner parties to weddings. And, most importantly, it has shown that you can make a business out of urban agriculture.